What does Mommy do when hubby and toddler are gone for the day? Shopping! Well, consignment sale shopping that is. It just so happened that there were two different consignment sales on Saturday. I have been going to consignment sales since Michael was born almost three years ago. I always find great deals on sometimes items that have never even been used. My wonderful grandma had sent me money to buy an early birthday gift for Michael. 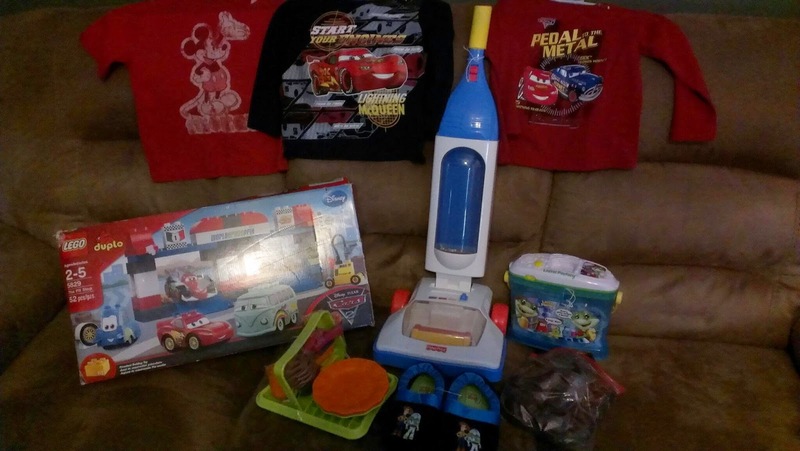 With the money she sent, I was able to get three items that were on his wishlist as well as some other things. This picture shows the items that I bought at the first sale, didn't take a picture of what I got at the second. For three shirts, four toys, and two pairs of shoes I only spent a total of $45! I'm sure the original cost of the Cars Lego Duplo set was that much or more. Consignment shopping is the way to go. Here in Northern Virginia, there seems to be several different sales in the Spring and Fall. There are also several all year round stores that you can go to. I don't get a lot of clothes at the sales anymore because I have an awesome step-sister-in-law who sends me a lot of my nephew's clothes that he's grown out of. If you are not blessed with a family member providing you with hand-me-downs, I highly recommend going to a consignment sale or store. It is so worth it! So, I did do a little regular shopping as well. I went to Hobby Lobby to see if I could find some large Easter eggs. I'm planning on taking Michael's Easter photos this year to save us money (going to a photography studio can be so expensive). I hit the jack pot there! 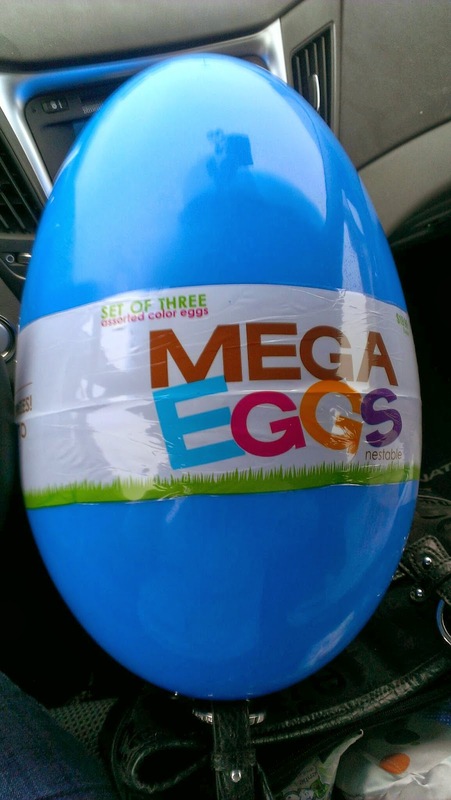 All their Easter decorations were 40% off and they had an 18" egg with a bonus of two smaller eggs inside it! With the discount, the three large eggs cost me a little under $12. Not bad for the only prop that I needed to purchase. I'm planning on having our little photo shoot this weekend so I'll have a post about it afterwards. 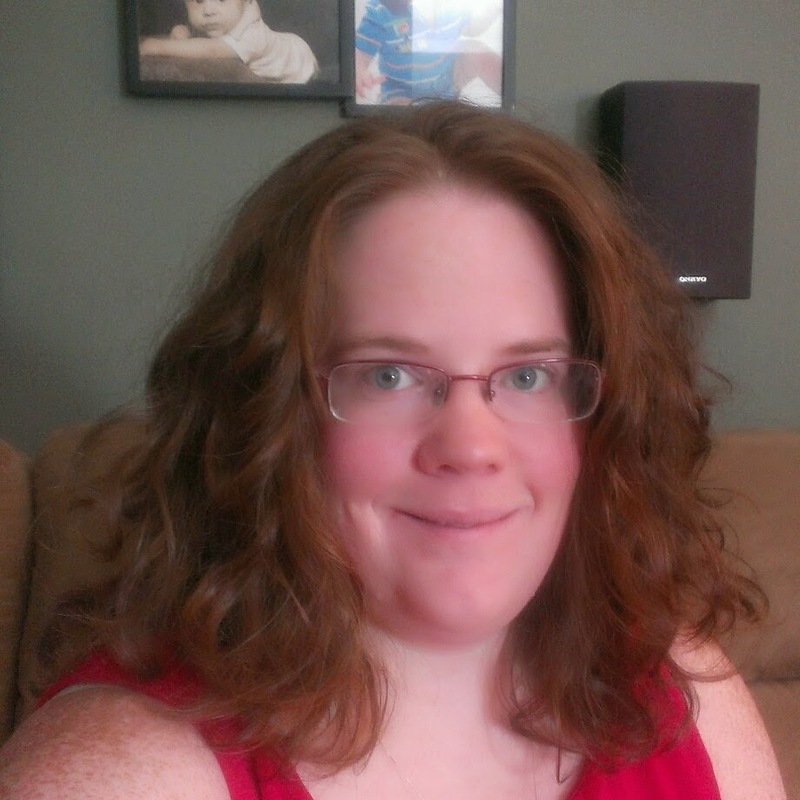 What do you fellow mommies out there do when the hubby and kiddos are gone for the day? I wanted to also work on my bedroom. It needs some major origination.